Facebook yesterday announced the introduction of group calling on its chatting app, Messenger. Essentially, people in a Facebook chatting group can now have an audio conversation together instead of just typing to each other. The feature is rolling out today and is available on Android as well as iOS. To make a group call, from any group conversations, just look for the phone icon and tap it to start a call. If you can’t see the phone icon, it’s probably because you haven’t updated your Messenger app yet. Another common problem is if you try to add someone to a Messenger and get an error, they might not have the app installed. We tried the feature here at the office and the call was a bit choppy, had delays, feedback and with lots of background noise so it didn’t strike me as something that’s ready yet to be relied on as a primary voice service. Still, this may have been an exception to what most are experiencing. That said, where Facebook group calls would really make a difference is for people that don’t already use Skype, which already offers group calling, with the option for video. 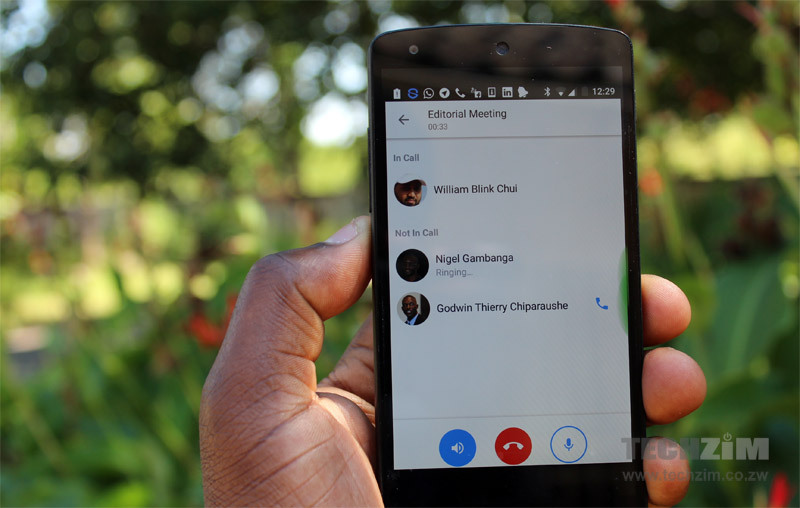 The problem is that in Zimbabwe, mobile data is still too expensive and not reliable enough to support voip calls. It’s the same problem with WhatsApp calling – it hasn’t replaced regular voice calls (as we expected it would) because it’s just not reliable yet and it’s too expensive. One interesting thing I noted though is that of the 4 contacts we wanted to sample this with, 2 didn’t have the Messenger app installed. Both felt they didn’t need it because the regular Facebook app does most of what they’d need Messenger for. Would be interesting if these Messenger app only features will drive up the usage of the app and draw some people from competing apps like WhatsApp.